It’s been all over the news. A plague. Then you notice strange sights around your neighborhood, and co-workers stop showing up for work. Houses around yours become quiet, and just a bit eerie, with curtains and blinds drawn and no activity to be seen. Your obnoxious neighbor who always plays his music too loud and tosses garbage on your lawn hasn’t been seen for days. That doesn’t bother you so much. Then it happens. A zombie shambles up on your lawn. What do you do? Did you prepare? Have you even watched any of the plethora of movies or TV shows about the zombie apocalypse? No? Well, hopefully you either have a strong survival instinct or you have a bit of the Macgyver gene. Or you read this blog. There is a small number of the population who strongly believes in the zombie apocalypse. The zombies of old (created by a comet or some other celestial body, or even a derivation of the Book of Revelation) have given way to a scary new premise – that of a super virus that first kills its victims and then reanimates the corpse and turns it into a killing machine. Whether that’s possible or not…who knows? I believe in being prepared, and my house has survival kits for hurricanes already in place. But…a lot of that can be used for a zombie apocalypse as well. 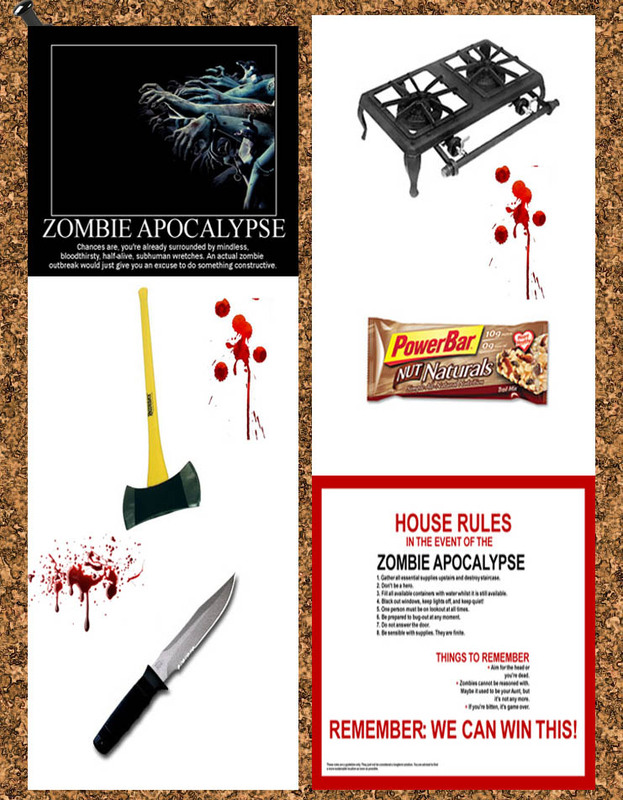 In honor of Halloween and zombie aficionados everywhere, I bring to you a zombie preparedness list, and some tips for surviving in a new world dominated by reanimated, flesh-eating corpses. Never mind Zombieland (my favorite movie) and the rules given about double tap. Most people don’t know how to shoot a gun, and would end up with a dislocated shoulder if they used a shotgun. Plus, how good can your aim be if you’ve never shot a gun? Machete’s and axes (or hatchets) are the way to go. Buy one, sharpen it, and practice. You most likely have one in your shed or garage right now. Start getting familiar with it. Yes, it’s close action and you might get zombie goo on you, but it’s better than blowing out car tires or house windows instead of the head of the zombie coming at you. Also, you can never go wrong with a baseball bat. This may appeal to the more squeamish among you since it just involves bashing and not cutting. Swing away! Keep a hunting knife in a sheath on your belt or waistband. Again, guns are great if you know how to use one, but they are loud, and will attract other zombies. If the machete fails, you can grab the knife and go for an eye socket. Prepare to hold up somewhere. If you have a two story house, great. You can destroy the staircase and turn rooms into survival dens. Stock closets with rations and water, and keep flashlights, portable stoves and fuel, blankets, books, games, etc on hand. If your house is one story, get out. Unless you had the foresight to block the windows and glass doors, you’re in a bad place. Look for a place you can defend. Carry a back pack with the minimum in it, because weight will add up. Energy bars, change of socks, flashlights, first aid kit, and water. If you are familiar with guns, don’t carry the big calibers. Even a .22 rifle will work if you know what to do with it. Handguns are easier to carry, but not great for long shots if you want to pick zombies off before they get close. Please don’t rely on your Call of Duty training, however. This does not mean you know how to use a gun. The most important piece of advice I can give you is to alter your perception and attitude. This is literally a fight to the death. If you can’t rally the strength that it takes, and put to use common sense, then no matter how well you fortify your defensible position, you won’t make it. It’s scary. It’s something no one wants to think about, but one day…one dark night, as you’re walking the dog, you might see something in the road ahead of you, what you at first mistake for old Mrs. Foster. Then she’ll get close. You’ll see the blood, smell the stench, and see her eyes rolling wildly around in their sockets, her arms reaching up, hands grasping, and you’ll notice the broken fingernails with bits of…well, let’s just hope that doesn’t happen if you’re not prepared. Previous Post Science Fair Time!